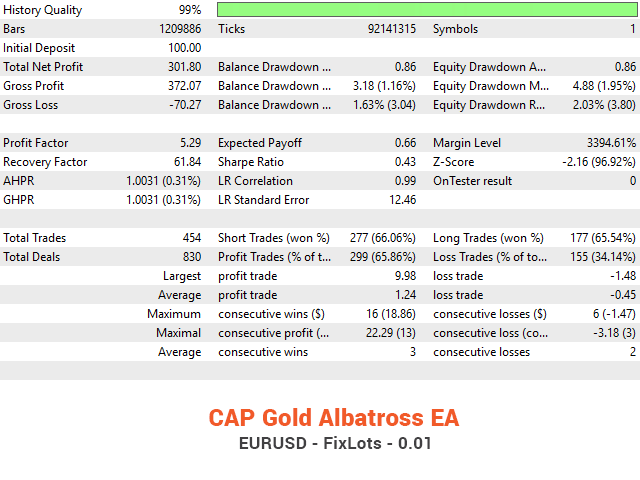 The CAP Gold Albatross EA is a pure mathematical scalper that trades tick data aggressively. 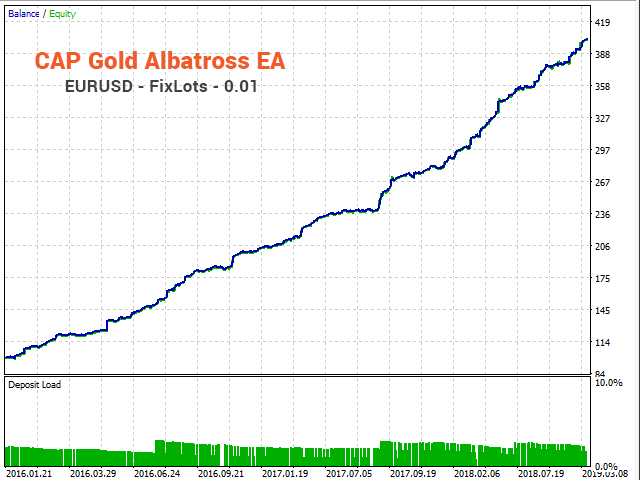 It implements a simple and universal trading strategy which can be applied to any instrument. No need in a large initial deposit. Always uses Stop Loss to protect capital. Position trailing stop is used. Both a fixed lot and a free margin percentage are used. 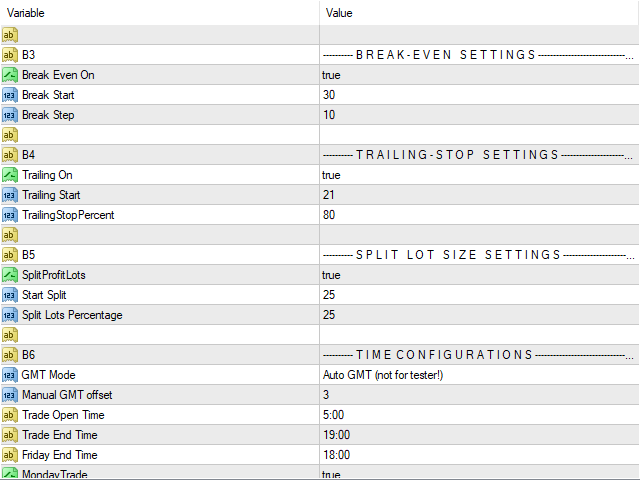 Ability to set time limitations for the EA operation. A good broker with low slippage. Low spreads (recommended: EURUSD spreads below 5 points). Low stops level (recommended: stop level 0 points). Latency of VPS / hosting must be below 4ms (recommended: use MQL5 hosting). 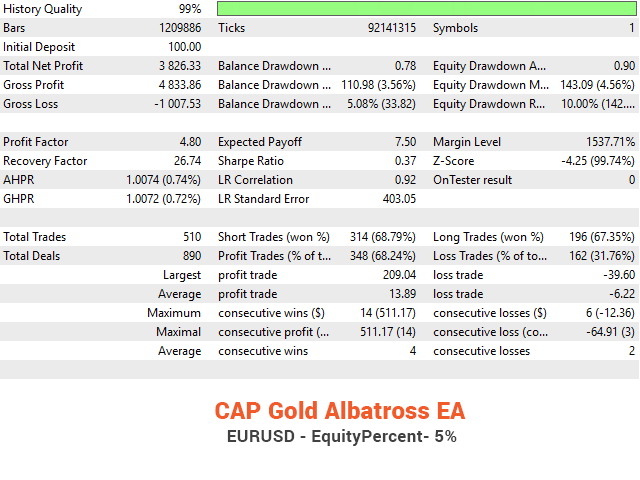 It is important backtest CAP Gold Albatross EA with the simulation coefficient of not less than 99%. Some brokers have a significant delay in triggering of stops and orders, which is critical to any trading. LotsType - Select any of lots management type. EquityPercent - Lot is chosen automatically based on percentage of the equity. 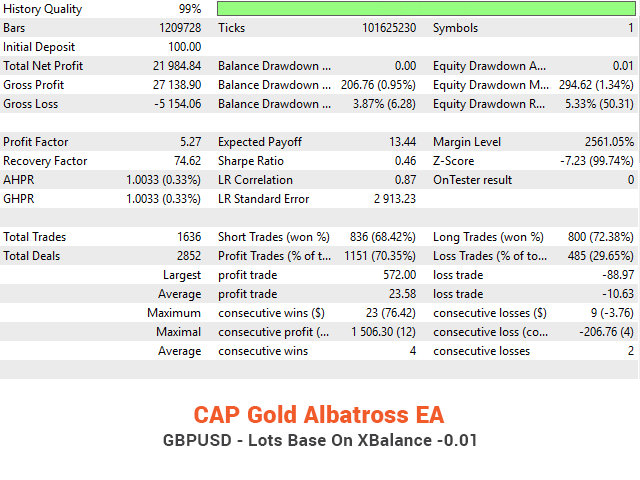 UseMarginPercent - Lot is chosen automatically based on percentage of the full margin value. 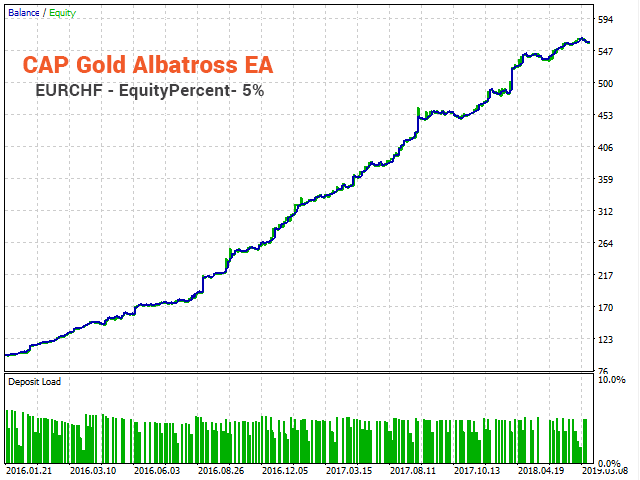 For example, if you set 100% then EA open lots size based on 100% of free margin. XBalance - Lot will increase based on XBalance amount. 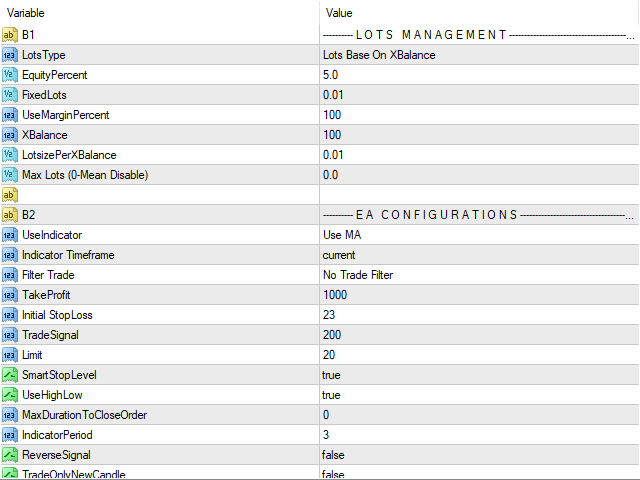 Calculated as (Your Current Balance/XBalance * LotsizePerXBalance = Your current lots size). LotsizePerXBalance - Lot size of XBalance. UseIndicator- Choose indicator type to filter signal. 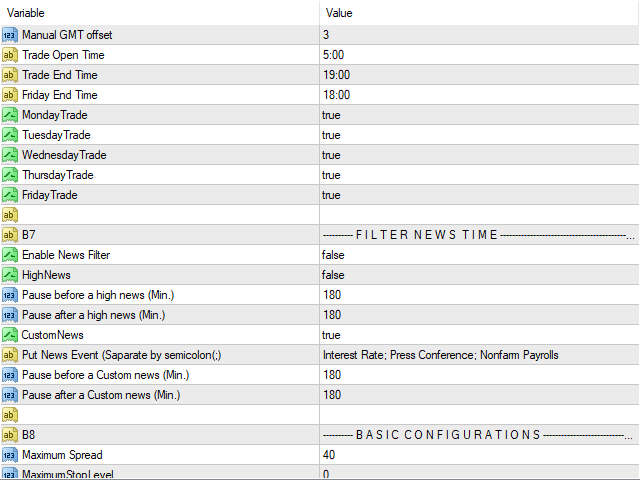 Filter Trade- Choose additional trade filter. TakeProfit - Take Profit (in points). StopLoss - Initial Stop Loss (in points). TradeSignal- The trade signal represents the directional volatility needed to trade. Increase value for better performance and less trade. Limit- Distance to reverse in points. SmartStopLevel - if True, StopLoss will move every tick with profit. MaxDurationToCloseOrder - Value in Minute for expire active orders. IndicatorPeriod - Indicator Period (MA or Band). ReverseSignal - if True, All signal will be reverse. TradeOnlyNewCandle- if True, One trade will be open only one candle. Active Break Even - True/False. MaximumSpread - Maximum spreads limit. MaximumStopLevel - Maximum stop level. CloseOrderOnSpread - Delete pending order if Spreads reach Max Spreads. 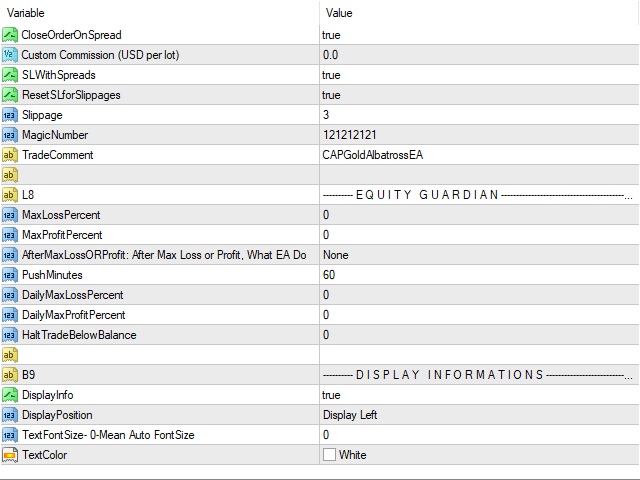 ECNBroker- If true, EA place order first then set StopLoss (Broker which not allow place order with StopLoss). Slippage - Maximum slippage value. to the list of URLs for WebRequest. To do this, open Tools > Options > Expert Advisors. Check the option "Allow WebRequests for listed URL:". Add the following: "http://ec.forexprostools.com","https://time.is/UTC" and press "OK". The EA takes news from the specified websites. У меня поставлен, на демо, 1 неделю- молчок,но сегодня, на новостях, заработал 700 баксов .Главное, что бы ДЦ не тормозило . На тестах, многие роботы -Львы Толстые,а на деле...А этот, меня удивил.Еще месяц понаблюдаю. This ea has never launched a trade! Советник стабильный, настройки из скриншота, рекомендую попробовать. Great EA. Backtest shows great results, starting forward testing now. Thank you for sharing. Backtest is very good. I think it will make profit. Very good backtests on GBPUSD M1. Just not sure how it will perform in live account but I'm excited to see. Все оценки 5 звезд поставлены за хорошие тесты???? Вы серьезно??? Обновление 16/04/2019: Теперь советник стал платным. Все оценки поставлены за премиум set file пока советник был бесплатным, который все равно на реале торговать в плюс не будет. Отличные результаты в тестере,посмотри на реале. 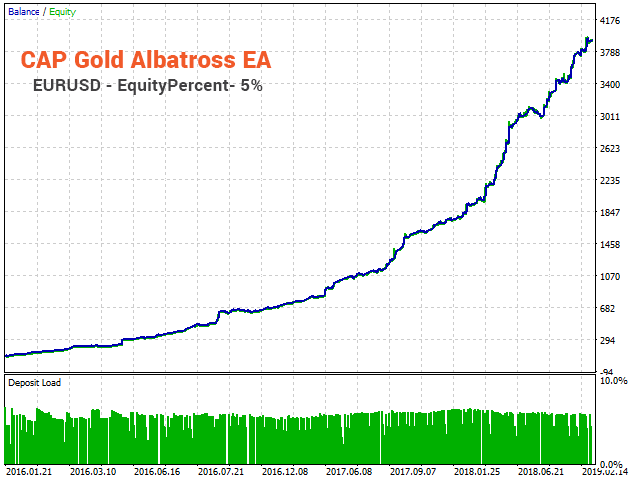 Great EA, tested and started with recommended balance and rocket your way up. The author selflessly contributes! Five-star evaluation! Thanx for the generous share Dear Ali, back test looks quite good. Monday begins forward test. Will update the rating according to profitability. 5 stars for the generosity ! Update: This one cannot be made profitable in all or any kind of market moves. 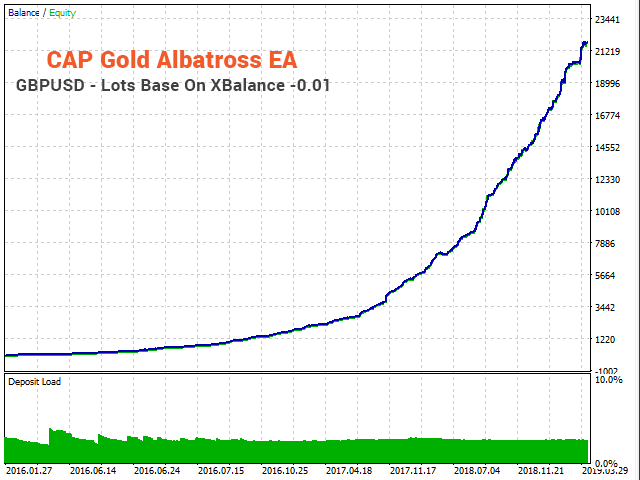 Where a breakout ea made 12 percent in one day in gbpusd on Tuesday this one lost 0.5 percent !